NOTE: This mob is transient and will appear in random zones. For our purposes, she's listed in North Ro because she has to go "somewhere" and the North Ro zone listing just happened to be that place. 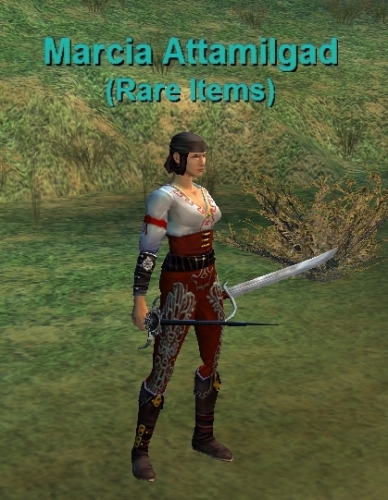 Marcia Attamilgad is an adventure merchant who only deals with the Noble currency. She will spawn in one of a number of possible zones (see below) with a single rare item for sale at approximately 00:00 PDT each day (her location and loot table do not appear to be affected by server restarts). For information about locating her at any given time or to see what she won't buy, see this quest entry. North Karana: -629, -123, -7 in the Gypsy Camp mid zone. This page last modified 2019-04-06 11:35:16. Seer's Orb Of Power. 35 Nobles, req lvl 55. Added Grimling Bone Bow for 15 Noble. Found a new item on Marcia Attamilgad today - Crown of the Undead Warmaster for 35 Nobles! anyone know what new items have leaked out of her hidden stash? Let us know if you or anyone else finds anything new on her! If you do not know what this is, here is a quick and easy guide on how to use these. The items I picked and listed, I feel are some of the rarest in game, but that's just my opinion. I camped Marcia for a while for some items. She seemed to repop right around 6pm est every time. smells of oakwynd? skinned many gnomes i tinkered me a mask? will she be selling a mask of tinkering or the famous oakwynd? if so how much? she also does not offer to buy back my BFG or mask of the devious (all/all gnome mask). i also was NOT offered any nobles for . . .
Is the Manastone from the Swashbuckler, useable everywhere?